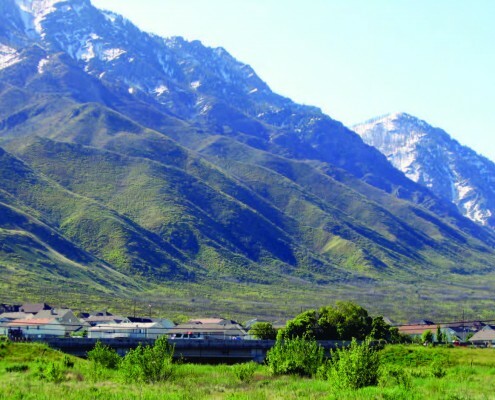 The Wasatch fault zone (WFZ) is Utah’s longest and most active fault. 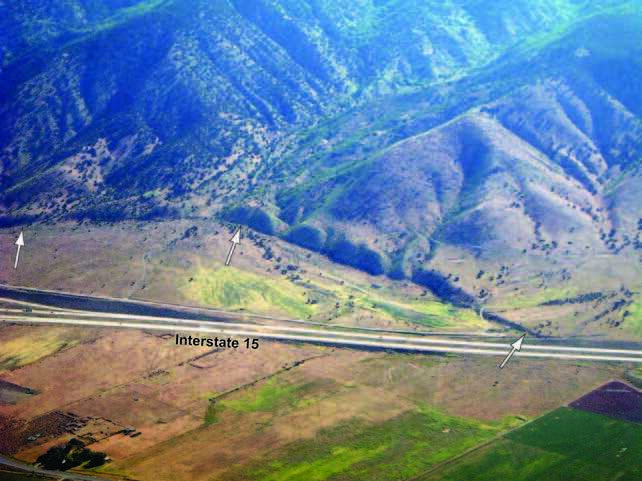 The central (and most active) part of the fault, roughly from Brigham City to Nephi, includes five segments. The Nephi segment, the southernmost of the five, extends from Payson to Nephi. Until recently, the Nephi segment had the most poorly constrained record of prehistoric earthquakes of the central segments, despite having the youngest-looking fault scarps of all the WFZ segments and a location close to the Provo-Spanish Fork metropolitan area. Evidence for large-magnitude (M 7) earthquakes on the Nephi segment includes surface faulting along two distinct strands: a northern strand bounding Dry Mountain near Payson and Santaquin and a southern strand bounding the Wasatch Range east of Juab Valley near Mona and Nephi. 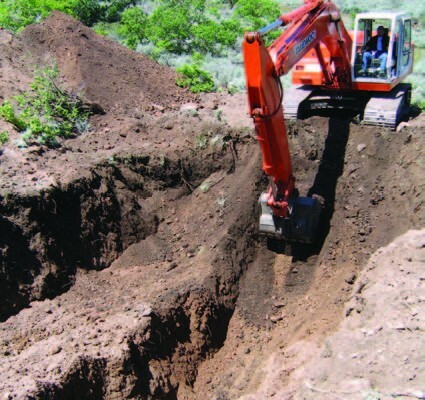 During the summer of 2005, the Utah Geological Survey (UGS) excavated trenches on the northern strand of the Nephi segment near Santaquin, in conjunction with trenches excavated on the southern strand east of Mona at Willow Creek by the U.S. Geological Survey (USGS). 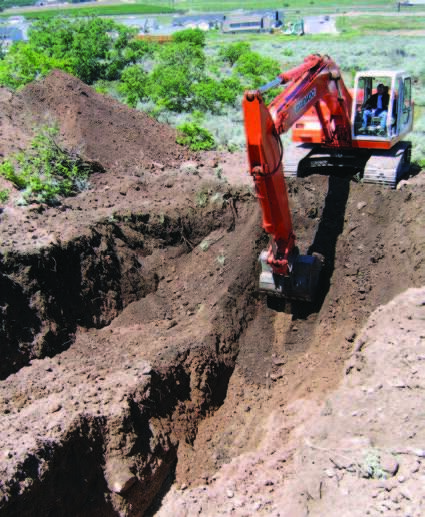 Studying the earthquake history at the Santaquin site is critical for determining (1) the timing, frequency, and magnitude of surface-faulting earthquakes on the previously untrenched northern strand, and (2) the extent of surface-faulting earthquakes on the Nephi segment, including whether all or part of the segment ruptures during a large earthquake. 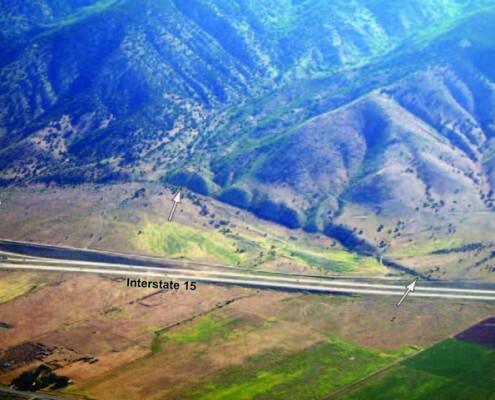 Ultimately, the geologic information being developed for the Nephi segment will contribute to our knowledge of the frequency, magnitude, and distribution of large surface-faulting earthquakes on the Wasatch fault zone, and allow for the refinement of both fault-segmentation and seismic-hazard models for the Wasatch Front. At the Santaquin site, surface faulting from a prehistoric Wasatch fault earthquake displaced late Holocene (less than 5000 years old) alluvialfan deposits, forming a 10- to 13-foot-high (3-4 m) scarp. To investigate the prehistoric earthquake, we mapped the surficial geology, measured topographic profiles across the fault scarp, and excavated two 65- to 100-foot-long (20-30 m) trenches. The fault trenches exposed subsurface evidence for one prehistoric surface-faulting earthquake in the alluvial-fan sediments. We identified wedgeshaped deposits of scarp-derived colluvium (sediment eroded from the scarp face and deposited shortly after the earthquake) and, based on the correlation of faulted alluvial-fan deposits in the trenches and scarp profiling, found that 9.8 feet (3.0 m) of vertical ground-surface displacement accompanied the earthquake. To determine the timing of the earthquake, we collected samples for radiocarbon dating from an organic-rich soil buried beneath the scarp colluvium and therefore older than the earthquake. Two samples from the soil indicate a maximum time since the earthquake of 500-550 years. Organic material from within the scarp colluvium yielded an average age of 425 years, which represents a minimum constraint on the timing of the earthquake. Samples collected from within older, pre-faulting alluvial-fan deposits indicate that the minimum time since the next older earthquake, for which evidence was not exposed in the trenches, is at least 1500 years and likely more than 6900 years. Slip rate and recurrence (repeat) time between large earthquakes are important fault parameters, which indicate how fast strain energy accumulates and is stored on the fault (slip rate) and how often that energy is released by fault movement in large earthquakes (recurrence time). At the Santaquin site, we estimated 30 feet (9m) of fault displacement across the nearby Bonneville highstand shoreline (which was abandoned about 16,800 years ago) and determined a long-term slip rate of 0.5 millimeters per year. By dividing our earthquake displacement (10 feet [3 m]) by the long-term slip rate we determined an average recurrence time between large surface-faulting earthquakes at the site of about 6000 years. 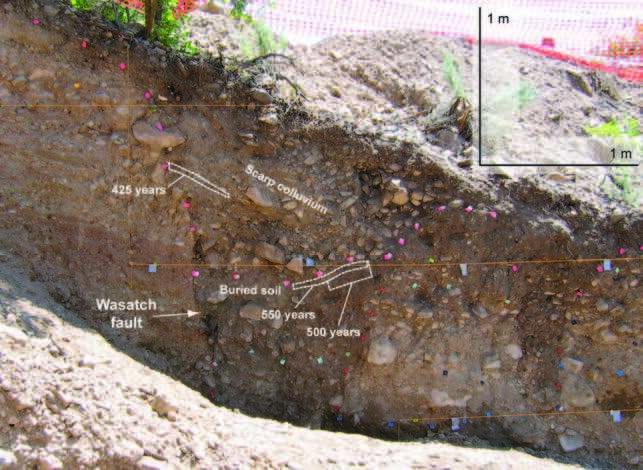 Our Santaquin trench study indicates that the most recent surface-faulting earthquake on the northern strand of the Nephi segment displaced the ground surface 10 feet (3 m) about 500 years ago. 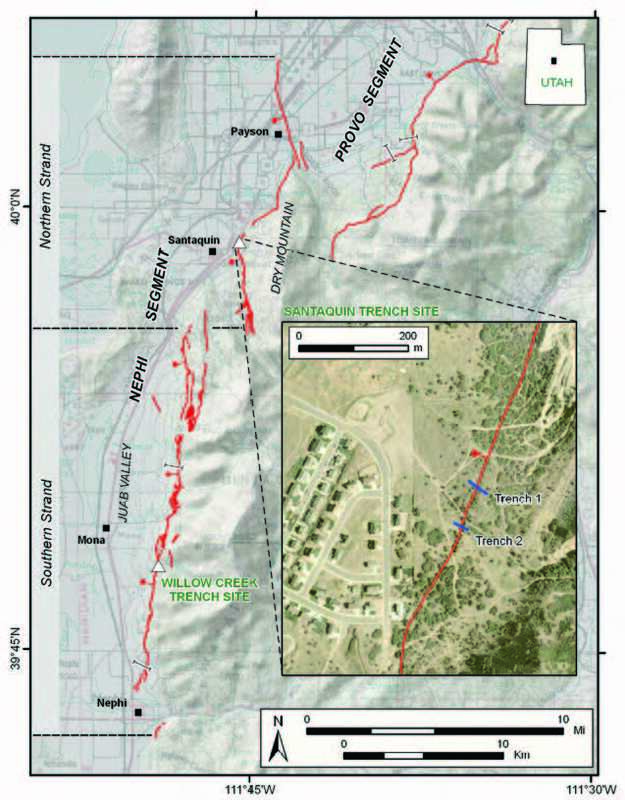 By comparing both the extent of surface faulting along the Nephi segment and the displacement observed in the Santaquin trenches with empirical relations between the magnitudes of historical earthquakes and the length and slip of the earthquake-producing faults, we estimate that the Santaquin-site earthquake had a magnitude of about 7.0. Strong ground shaking from the earthquake would have been felt strongly in both the Provo and Salt Lake metropolitan areas. 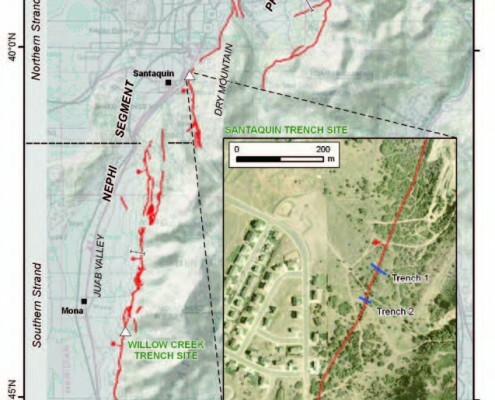 To complete our ongoing investigation, we will compare the Santaquin-site data with data currently being developed by the USGS for the southern strand of the Nephi segment, and analyze whether the entire segment or just part of the segment ruptures during a large earthquake, and whether multi-segment or spill-over rupture may occur between the Nephi and adjacent segments. These issues are important from an emergency-response standpoint because longer surface-fault ruptures generally produce larger earthquakes, which generate more intense ground shaking and result in more extensive damage. Chris DuRoss is a geologist with the UGS Geologic Hazards Program, primarily involved in investigating Quaternary fault hazards in Utah. He specializes in studying geologic evidence for the most recent (but prehistoric) large-magnitude, surface-faulting earthquakes in the Wasatch Front region. His recent work has included fault-trench investigations on the Provo and Nephi segments of the Wasatch fault zone, research into the potential for multi-segment ruptures on the Wasatch fault zone, and an update of the Utah Quaternary fault and fold database. 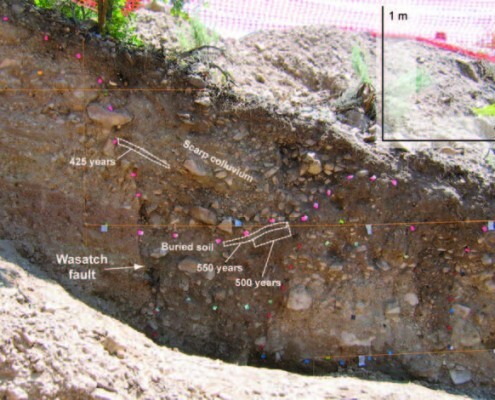 Chris’ upcoming research will focus on the prehistoric earthquake histories of the Weber segment of the Wasatch fault zone and the poorly understood West Valley fault zone in Salt Lake Valley. Prior to joining the UGS in 2004, Chris worked as a U.S. Geological Survey intern, studying geologic hazards in the Pacific Northwest, and completed a Master’s degree in geology at the University of Utah. Greg McDonald is a geologist with the UGS Geologic Hazards Program and worked on both the Salt Lake City- and Provo-segment “megatrench” paleoseismic studies. Since joining the UGS in 1998, Greg’s work has included several landslide and debris-flow investigations, surficial geologic mapping in Morgan and Ogden Valleys, analyzing geologic and shear-wave-velocity data for seismic-site-response characterization along the Wasatch Front urban corridor, and implementing survey-grade GPS-monitoring techniques to measure long-term movement of landslides. 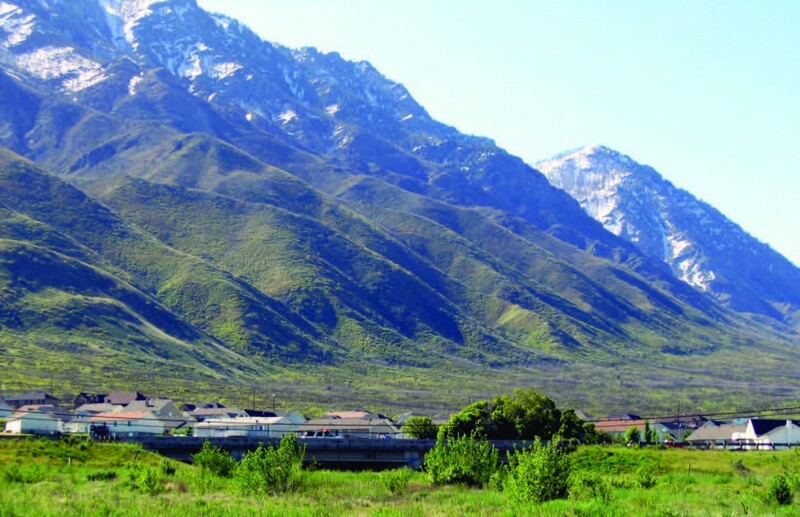 Prior to joining the UGS, Greg worked in Salt Lake City for an environmental/geotechnical consulting firm for over five years after graduating from the University of Utah in 1992.